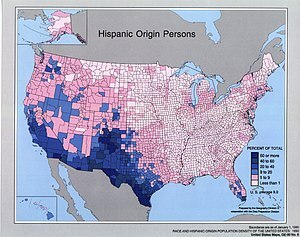 The explosive growth of the Hispanic population reflected in the 2010 census will remake the electoral map—and could present Republicans with a challenge. Republicans have broadly benefited from the nation’s continued population shift from the Northeast and Midwest to right-leaning Sun Belt states in recent decades, and those states are again expected to add seats in Congress in the next election. But to take full advantage, Republicans will have to win over Latinos, who have fueled much of the population growth, and who lean Democratic in their voting. They accounted for 65% of the population growth in Texas over the past decade, 55% of the growth in Florida and nearly half of the population increase in Arizona and Nevada, census figures show. Those four states alone are due to add a combined eight congressional seats in the next election. Republicans control the process of drawing the boundaries of congressional districts in Florida and Texas, which account for six of the new seats, while a Republican governor will spar with a Democratic legislature to draw a congressional seat in Nevada. A commission will decide the new lines in Arizona. Hispanics have historically voted in lower proportions than blacks and whites. In 2008, they voted for President Barack Obama by nearly 2-to-1. But some GOP leaders say Hispanic voters like the party’s message of low taxes and family values. They also note that a new cadre of rising Hispanic stars, among them freshman Florida Sen. Marco Rubio and New Mexico Gov. Susana Martinez, has the potential to draw more Hispanics to the party. In Texas last November, a pair of Republicans—one of them Hispanic—beat incumbent Democrats in majority-Hispanic districts, and Nevada voters elected Republican Brian Sandoval as their governor, even as Latinos voted overwhelmingly for the U.S. Senate’s top Democrat, Harry Reid. The risk, analysts say, is that tough language from some GOP officials on illegal immigration risks turning off Hispanic voters, many of whom view that rhetoric as a cultural affront. “The Hispanic vote is increasingly important, and Republicans are going to need to do substantially better with this community to keep our majority for the long-term,” said Oklahoma Rep. Tom Cole, a former chairman of the National Republican Congressional Committee. Complicating the process, the Voting Rights Act of 1965 may require officials to draw the House district boundaries in such a way that some of the eight new seats have a majority Hispanic population. Democrats and Hispanic advocacy groups argue there should be as many as four new majority-Hispanic districts in Texas and Florida, while some Republicans say they see at least one. The law and related court rulings make it hard for officials to undermine existing districts in which minority groups hold a majority. In 2006, the Supreme Court ruled that Texas’s prior redistricting process violated minority rights by diminishing Hispanic representation in the 23rd House district, a protected majority-Hispanic district. That ruling had the effect of forcing state officials to redraw several districts in addition to the 23rd district. In Texas, among states that must clear their new House maps with federal officials, Hispanics make up 38% of the population. Yet only six members of the state’s 32-member congressional delegation—fewer than 20%—are Latino. Although Republicans control every aspect of redistricting in the state, even some GOP lawmakers privately at least two of the new seats should have a majority of Hispanic residents to avoid dilution of minority voting strength. Florida will add two new U.S. House seats in the next election, but a legal tussle over self-imposed redistricting requirements has delayed the process. Hispanics make up nearly a quarter of the state’s population, but Hispanics hold only three of the state’s 25 congressional seats. All three are Miami-area seats occupied by Republicans of Cuban descent. Cuban Americans, unlike other Latino groups, tend to vote overwhelmingly for Republicans. While Hispanics represent at least a quarter of the population in four other districts in the state, their overall population may be spread across the state in ways that do not force an additional majority-Hispanic district.